The T-Gage V series offers the latest technologies that will make inspection easier and each model has been built to perform in the roughest of industry conditions. The suite of gauges come with monochrome displays as standard. To enhance the user experience a colour display (C) can be configured, as can the additional A-Scan functionality (W). Simple upgrade options are available throughout the life of your gauge. The T-Gage VB is a basic variable velocity gauge with probe and is the most economical model designed to make reliable, accurate thickness readings; primarily on steel structures with access to only one side. Packaged in custom moulded high density casing, with a rubber keypad, this gauge offers the end user a simple working interface. This model is easily upgradeable in the field to deliver datalogging functions. As a mid-range model the T-Gage V offers the most popular features including echo-to-echo (E-E). These include increase/decrease in gain; vibrate & illuminate the keypad on alarm conditions and with the “transducer attendant” - the end user is notified when to replace the transducer. Simple field upgradeable options include A/B-Scan capability and the data logging software, Data XLS. 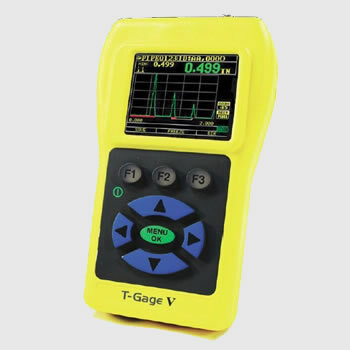 The T-Gage VDL is the top of the range model offering all the features of the VDL together with the the flexible data logger, taking up to 50,000 readings, B-Scan and Echoto- Echo functions. It also includes the Data Management Software, customised pouch, belt clip and elasticated hand strap to easily use the unit in either hand. The EZ Scan 4 is a small, single axis linear B-Scan encoder, for use with the T-Gage V DLC, with magnetic wheels and a couplant delivery system. Ideal applications include storage tank bottom and side walls, flat plates and pipes with a 10 cm (4”) or greater outside diameter. The scanner comes as standard with a 5Mhz dual transducer spring loaded in two directions, other transdcuers are also available. Battery type: 2 x AA alkaline. Battery Life: operates for 50 hours (20 hours with backlight on). Display: 128 x 64 Graphics LCD monochrome. 220 x 170 Graphic Colour TFT display. min at the same time, velocity, zero, calibration, units, freeze, unfreeze, % battery life remaining, gain - low, std, high, echo to echo symbol. Delay line zero measurement: Auto at power up with listed numeric value. Ideal for correcting delay line wear/curvature and for transducer acoustic drift at elevated temperature. Measurement rate: 4/sec and 20/sec in fast mode. Gain: Low, Standard and High for varying test conditions. Alarms: Minimum/Maximum depth, vibralarm, beeps and display flashes as well as keypad illumination. Illuminating Keypad: F1 = Red, F2 = Yellow abd F3 -= Green for easy, go/no go testing (patent pending). Backlight: Light emitting diode, On/Off or Auto On based on valid readings or last key press. Differential Mode: Displays the difference from the actual thickness measurement and a user entered reference value. Scan Mode: Displays minimum or maximum thickness value at 20 measurements per second (ideal for high temperature thickness reading and tracking the minimum depth alarm). Press Freeze to capture the last valid minimum thickness readings prior to the loss of signal (LOS), without reading the couplant upon lifting the probe from the test piece. Hold Mode: Holds display to retain last thickness reading in reverse video display. Warranty: Limited 2 year warranty on parts and labour. Casing: Customised, splash proof (IP54), high impact plastic with rubber. Illuminated keypad for go/no-go testing. Carrying Pouch: Custom moulded pouch with belt clip, wrist strap for left or right handed operators (optional). Shipping Case: Hard plastics with high density moulded cut out for all accessories (optional). Standard T-Gage VB series kit includes: UT Thickness gauge, DKS-537 twin crystal 5Mhz 0.375”/9.52mm dia. potted probe, operator manual, cable, couplant and carry case. Standard T-Gage V series kit includes: UT Thickness gauge, Echo-to-Echo mode, DG537 twin crystal 5Mhz 0.375”/9.52mm dia. potted probe, operator manual, cable, couplant and carry case. Standard T-Gage VDL series kit includes: UT Thickness gauge, Echo-to-Echo mode, DG537 twin crystal 5Mhz 0.375”/9.52mm dia. potted probe, operator manual, cable, carry case and pouch, Data XLS, USB cable. Up to 200 hours operation on a single set of batteries. 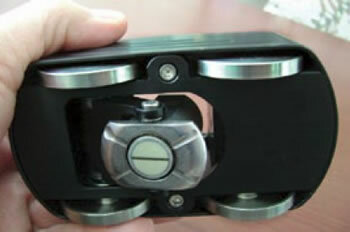 Thickness Range: 0.2 mm - 508mm (0.008 - 20 inches). Depending on material, temperature and transducer selection. Automatically informs the operator to replace the transducer. (Patent pending). on valid reading being taken or last key press. Information Displays: LoS, large reading while displaying min at the same time, velocity, zero, calibration, units, % battery life remaining. Casing: Customised, splash proof (IP54), high impact plastic with rubber. for left or right handed operators (optional). 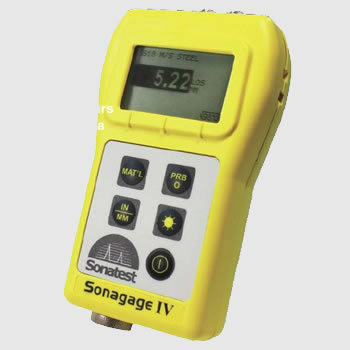 Standard Sonagage IV series kit includes: UT Thickness gauge, DKS-537 twin crystal 5Mhz 0.375”/9.52mm dia. potted probe, operator manual, cable, couplant and carry case. The new portable precision thickness gauge range from Sonatest Ltd, the Microgage III series, is available with choice between monochrome and colour displays, with or without A-Scan capability. All instruments across the range a field upgradeable, allowing the operator to opt for further features further down the line, without returning the instrument to the factory. The variety of features offered by the Microgage III series allows the user to select a quality tool that will exceed their application needs. The Echo-to-Echo capability allows the measurement of the thickness of materials without removing paint or coatings. 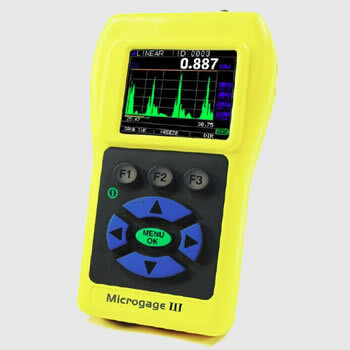 Designed with the user in mind, the Microgage III utilises state-of-the–art digital technology to produce fast and accurate readings. Available in 7 models including basic (B), datalogging (DL), with and without waveform(W) with monochrome or colour (C) displays. Storage and recall of set ups. Vibration and colour change with alarm. Multiple Modes for challenging applications. Real-Time adjustment of initial gain, slope, range, rectification, zoom and blankings. Fibreglass Thickness (boats), Coil Steel, Titanium (golf club heads), Rubber Tyres, Thin Walled Components, Aerospace applications, Plastics Manufacturing. Package: Custom, splash-proof (IP54), high-impact plastic with rubber, illuminating keypad for go/no-go testing. Battery Life: Monochrome operates for 50 hrs (20 hrs with backlight on). Colour display up to 40 hrs (15hrs with backlight on). Information Displays: LoS, min, max, large reading while displaying min at the same time, velocity, zero, calibration, units, freeze, unfreeze, % battery life remaining, gain - low, std, high, echo to echo symbol. Languages: English, German, French, Spanish, Czech, Finnish & others. Delay line zero measurement: Auto at power up with listed numeric value. Ideal for correcting delay line wear/curvature and for transducer acoustic drift at elevated temperatures. Stored Setups: Ability to store up to 30 custom set ups to retain valuable parameter settings such as sound, velocity, gain, slope, range. Class 2: Delay line (interface echo) to first back echo. Class 3: Echo to Echo following an interface echo from a delay line or water column. Waveform: Live colour waveform with dynamic colour change on alarm, large thickness reading. Live monochrome waveform. Rectify: RF, Full Wave, Half Wave+, Half Wave-. Gain: Auto or Manual in 1dB steps for varying test conditions Low, Standard and High for varying test conditions. Time Dependant Gain: adjust for slope and gain level as a function of time. B-Scan: Cross sectional representation of test piece. Alarms: Minimum/Maximum depth, vibralarm, beeps and display flashes as well as keypad illumination and dynamic waveform colour change. Illuminating Keypad: F1 = Red, F2 = Yellow and F3 = Green for easy, go/no go testing (patent pending). Shut Off: Auto time out (after 1-31 minutes user programmable after no reading L.O.S. or no key press or “never”). Scan Mode: Simultaneously displays minimum or maximum thickness value at 20 measurements per second (ideal for tracking minimum depth). Case: Customised, splash proof, high impact plastic with rubber. Carry Pouch: Custom moulded pouch with belt clip, wrist strap for left or right handed operators (optional). Standard Microgage III series kit includes: UT Thickness gauge, transducer (10MHz with cable), operator manual, cable, couplant and carry case. Data XLS software available with DL versions only.